Cracker Barrel Old Country Store and Dr. Ralph Stanley have announced the upcoming CD release of Ralph Stanley & Friends: Man of Constant Sorrow, which will be available on 19th Jan 2015, exclusively at all 634 Cracker Barrel Old Country Store locations and online at crackerbarrel.com. The digital album will also be available at select digital retailers. Ralph Stanley & Friends: Man of Constant Sorrow features Stanley performing duets with guest artists including Dierks Bentley, Elvis Costello, Del McCoury, Buddy Miller & Jim Lauderdale, Old Crow Medicine Show, Robert Plant, Ricky Skaggs, Nathan Stanley, Josh Turner, Gillian Welch & David Rawlings, and Lee Ann Womack. Stanley also performs two solo songs, including his signature tune “Man of Constant Sorrow.” Produced by Miller and Lauderdale, Ralph Stanley & Friends: Man of Constant Sorrow will sell for $11.99. I have always enjoyed performing with other musicians ever since my older brother Carter and I started playing music together when we were kids. I am excited to share these collaborations with such wonderful artists with our fans. So many of my fans are regular visitors to Cracker Barrel, so I’m happy to have my project available exclusively there so they can find the CD in one of their favourite locations – Ralph Stanley. Cracker Barrel is honored to offer this album featuring the legendary Ralph Stanley and a variety of talented artists through our exclusive music program. Many of our guests are huge bluegrass fans and we know they will enjoy this once-in-a-lifetime album – Cracker Barrel Marketing Manager Julie Craig. After Carter died in 1966, Stanley continued to perform and record as a solo artist. Though the years, he helped mentor several future bluegrass and country music artists who performed in his band before embarking on solo careers, including Ricky Skaggs, Larry Sparks and Keith Whitley. In 1976, Stanley received an honorary doctorate from Lincoln Memorial University in Harrogate, Tenn., and he has been known as “Dr. Ralph Stanley” ever since. He was presented with the National Heritage Award by President Ronald Reagan in 1984, elected into the International Bluegrass Hall of Honor in 1992 and inducted into the Grand Ole Opry in 2000. His performance of “O Death,” featured in the movie “O Brother, Where Art Thou?,” earned him his first Grammy Award in 2001 for Best Male Country Vocal Performance. The soundtrack album for that movie also earned Stanley both a Grammy Award and a CMA Award for Album of the Year. His album Lost in the Lonesome Pines earned Stanley his third Grammy Award in 2002, this time for Best Bluegrass Album. His performance of “Me and God” with Josh Turner received an ACM nomination for Vocal Event of the Year in 2006. That same year, he received two major honors: the Living Legend Award from the Library of Congress and the National Medal of Arts from President George W. Bush. He released his autobiography, Man of Constant Sorrow in 2009. Stanley received a second honorary Doctorate of Music degree from Yale University on May 19, 2014, and was elected as a fellow in the American Academy of Arts and Sciences on Oct. 11, 2014. For tour dates and more information, visit drralphstanleymusic.com. 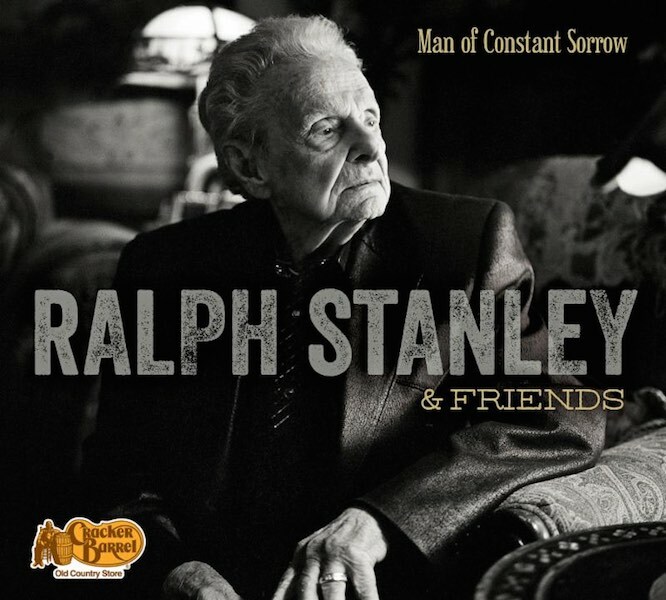 Ralph Stanley & Friends: Man of Constant Sorrow is the latest CD release in the Cracker Barrel Old Country Store exclusive music program. Since 2005, Cracker Barrel has released CDs with a wide variety of artists, some of which have debuted in the top three spots on a range of Billboard’s charts including Top DVD Music Videos, Top Country Albums, Top Contemporary Christian Albums and Top Bluegrass Albums. The Cracker Barrel Old Country Store® exclusive music program includes CDs with Alabama, Rodney Atkins, Mandy Barnett, Clint Black, Jason Michael Carroll, Steven Curtis Chapman, Dailey & Vincent, The Charlie Daniels Band, Ronnie Dunn, Edens Edge, Sara Evans, Bill Gaither, Vince Gill and Paul Franklin, Amy Grant, The Grascals, Merle Haggard, Alan Jackson, George Jones, Alison Krauss & Union Station, Neal McCoy, Montgomery Gentry, Russell Moore & IIIrd Tyme Out, Craig Morgan, The Oak Ridge Boys, Brad Paisley, Dolly Parton, Smokey Robinson, Kenny Rogers, The Secret Sisters, Ricky Skaggs, Michael W. Smith, Aaron Tippin, Randy Travis, Josh Turner, Wynonna and the Zac Brown Band. For details, visit crackerbarrel.com. Cracker Barrel Old Country Store, Inc. provides a friendly home-away-from-home in its old country stores and restaurants. Guests are cared for like family while relaxing and enjoying real home-style food and shopping that’s surprisingly unique, genuinely fun and reminiscent of America’s country heritage…all at a fair price. The restaurant serves up delicious, home-style country food such as meatloaf and homemade chicken n’ dumplins as well as its made-from-scratch biscuits using an old family recipe. The authentic old country retail store is fun to shop and offers unique gifts and self-indulgences.